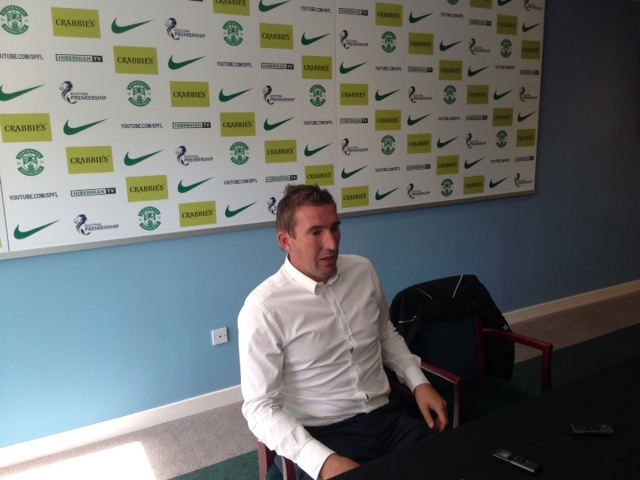 Hibs’ Head Coach Alan Stubbs was delighted with his players’ performance during yesterday’s emphatic 4-0 win over Rangers at Easter Road. His gamble of playing vice-captain David Gray who has been suffering form a groin/stomach problem which will require an operation paid off when the former Manchester United defender opened the scoring in the eighth minute with a sensational strike. Youngster Jason Cummings added a second a few minutes later then second half goals from Scott Robertson and birthday boy Liam Craig secured the historic victory. After the game Stubbs told Hibs TV: “I’m thrilled – I’m actually trying very hard to hold all the excitement in; we were outstanding. “I thought all our goals were good – from David’s strike to the other goals with our movement and build-up play, which was first class. “Overall, I’m really happy and the win was fully deserved. “It sets us up great for the Derby. It’s always nice to go into a Derby on the back of a morale-enhancing win – it will be another cracker next week. “Hearts are at the top of the league, but if we perform in that game like we did against Rangers we will give them a very good game. Coincidentally the last time Rangers lost by four clear goals was against Celtic fourteen years ago when a certain Alan Stubbs played in a famous 6-2 win.